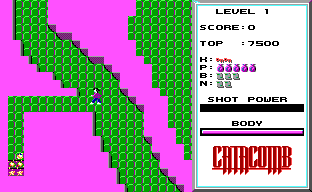 During the demo hold down C and T, and then press SPACEBAR to warp to a level. While playing the game, press CTRL + ALT + Q to increase the number of keys, healing potions, bolt spells and nuke spells. Here's a video of me finishing Catacomb in less than 4 minutes. Here are all the maps of all ten levels of Catacomb and all thirty levels of The Catacomb. The maps have been generated from the original data files. In the game everything outside the map is pink, in these maps everything outside the map is not shown. Download Catacomb maps and The Catacomb maps. VGMaps My maps of Catacomb 1 and 2 are also on this site. Pixelmusement - Ancient DOS Games - Episode 73 A video review of Catacomb. id Software The creator of Catacomb, John Carmack, works here now. Catacomb at MobyGames Catacomb's entry in the game database. The Catacomb at MobyGames The Catacomb's entry in the game database. Catacomb at Wikipedia Catacomb's entry in the free encyclopedia.